Sports injuries in the foot and ankle fall into two general categories – acute and chronic. Acute injuries are experienced in a sudden, traumatic incident. An example of this would be an infielder misplaying a ground ball and getting hit hard in her foot with a softball. Another is when a football player plants his cleats into the ground while the rest of his body is moving forward, thereby spraining his big toe. Chronic sports injuries, on the other hand, have a more gradual onset. These ones develop over time in response to accumulated forces on the injured area. The runner who develops Achilles tendinitis and the basketball player with a stress fracture have sustained overuse injuries. Ankle sprains. Even for non-athletes, ankle sprains are a common injury. 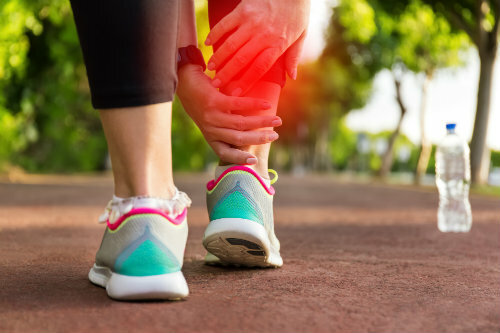 When the ligaments connecting the ankle bones are extended beyond their intended range of motion, we call it a sprain. It is relatively easy for an ankle to twist, turn, or roll in an abnormal fashion, which is why the condition is so common. Turf toe. In the aforementioned example of the football player, his big toe sprain is actually a case of turf toe. Many fans recognize the term because it can keep favorite athletes out of action for some time. Fractures. Sports involving hard objects (baseball bats, hockey sticks, balls, pucks) and surfaces have a certain degree of risk for broken bones. Stress fractures. Unlike other breaks, stress fractures are surface level cracks in bone that typically develop in response to overuse. Achilles tendinitis. Too much high-impact activity, or sudden increases in intensity, can cause problems for the Achilles tendon; particularly pain in the back of the heel during and following activity. In spite of the apparent injury risk, we still fully recommend you engage in an active lifestyle and exercise at least a couple of times every week. The benefits of doing so are numerous and, when they strike, most injuries are effectively treated with nonsurgical care. At Austin Foot and Ankle Specialists, our highly-educated podiatrists provide effective care for many patients who suffer foot and ankle sports injuries. If you have become hurt while playing a sport or participating in any physical activity, contact us to find out how we can help. Give us a call at (512) 328-8900 or request your appointment online right now for our Austin, TX foot doctors.